For an arty alternative to Christmas lights, we suggest that you hot-foot it to Blackpool’s Grundy gallery. 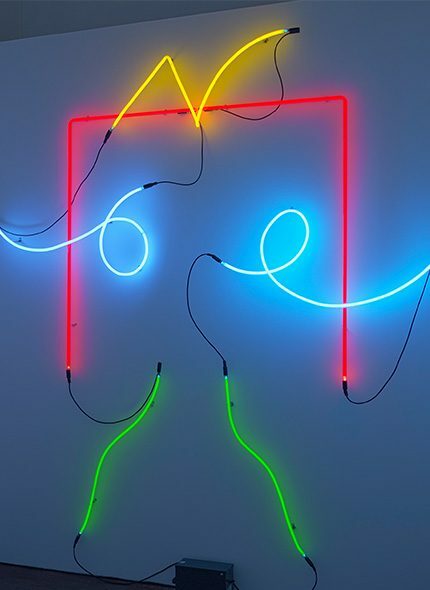 Their stunning show “NEON: The Charged Line” brings together some of the most internationally renowned neon artworks from the swinging ‘60s to the present day. 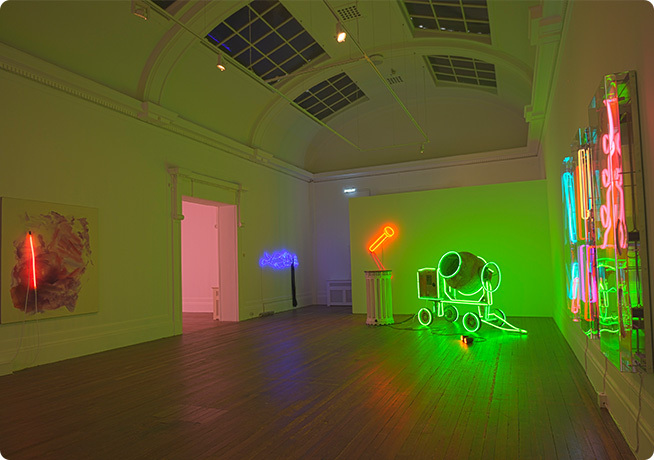 Journey through a series of eight, positively glowing rooms of luminous pieces by the likes of Tracey Emin, Gavin Turk and Cerith Wyn Evans and see how versatile the neon tube can be. The phosphorescence of neon, achieved by passing an electric current through different noble gases trapped within in a glass tube was first discovered in 1898 and subsequently patented by Georges Claude in 1915. In Britain, Blackpool was one of the first places to widely show neon in the early 1930s. Incidentally if you’ve never been to see their seafront illuminations we suggest that you add them to your bucket list for September 2017! 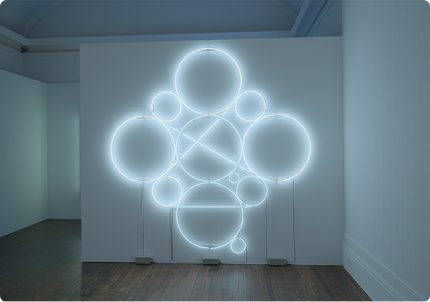 We were particularly excited by the inclusion of French artists Bertrand Lavier (his work Telluride II introduces this feature) and François Morellet, both of whom were early adopters of neon as an artistic medium yet their work has rarely been seen in the UK. And if you missed the mini Keith Sonnier retrospective at London’s Whitechapel Gallery earlier this year there is also a chance to see his jolly neon doodle “Pictogram II” (above) from 1980. 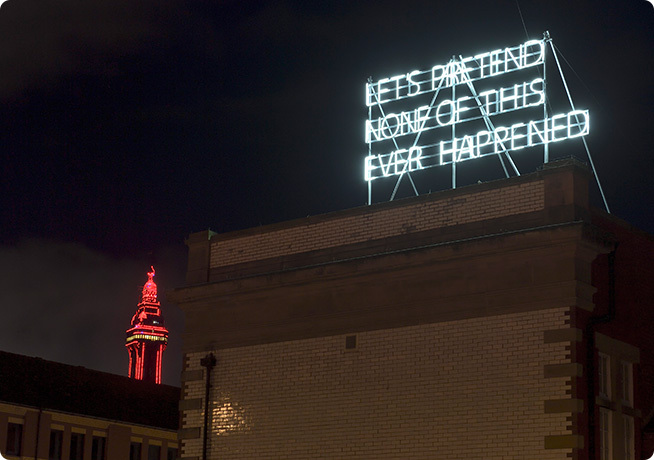 Wrap up warm and explore the streets of Blackpool where newly commissioned outdoor artworks by cutting edge names including Fiona Banner, Prem Sahib and Tim Etchells (pictured above) extend this illuminating show out of the gallery and into the town. 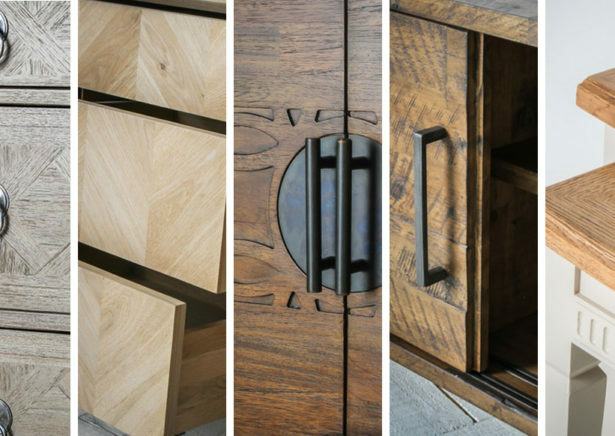 Get your skates on because the show ends on 7 Jan 2017. NB Special opening hours for NEON: The Charged Line: Tuesday – Saturday: 10.00 – 17.00, Sunday: 11.00 – 17.00. Closed Mondays, and from 24 Dec 2016 – 2 January 2017 inclusive.